I recently spent one amazing weekend in Philadelphia, the City of Brotherly Love… the Cradle of Liberty, and the birth place of a certain Fresh Prince. Though I only spent a measly four days in Philly, I can tell you one thing with certainty: Philadelphia is a fantastic city. I met a lot of great people, saw a wide range of beautiful places, and ate more delicious food than I have in a great long while. Oh, and the nightlife is to die for if you’re into unique bars, clubs, and musical venues of all varieties. You’ll love it. But I’m getting ahead of myself a bit here. In those 4 days, I managed to pack in a heck of a lot, and I’m going to tell you all about it in a whole series of articles about Philadelphia. Today, though? Today I’m going to start things off on a relaxing tone. One of my main criteria for whether a city is good or not, is how much green space the place has. I’m originally from British Columbia, Canada, and I’m used to having a ton of green around. No, not that type of green, though there’s no shortage of that either. Anyway, I think green space is important, and though I realize that not every big city will have sprawling natural forests, well… I still expect some half decent parks and relaxation spots. Thankfully, Philly has them in spades. 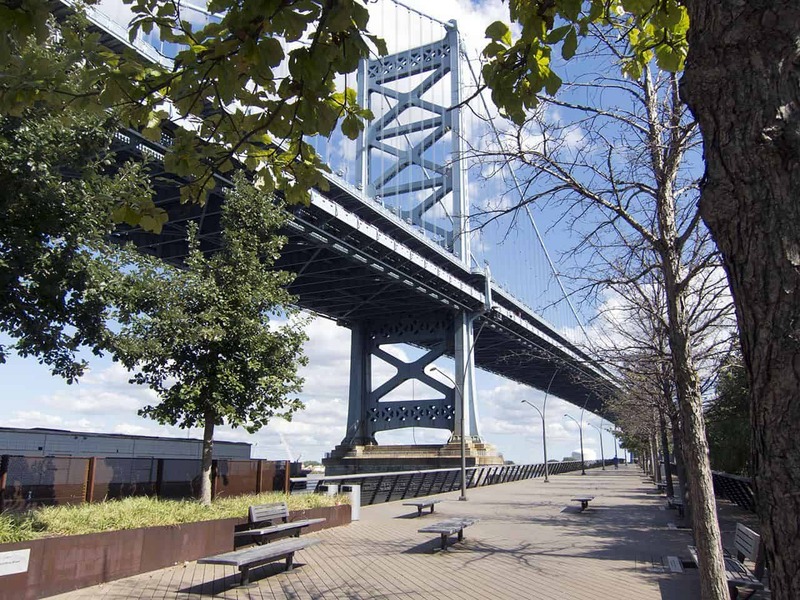 In the shadow of the Benjamin Franklin Bridge, looking out on the Delaware River, is the Race Street Pier, the perfect place to kick back, relax, and enjoy the sun as boats lazily drift along the river. The place was rather quiet when I paid a visit, but there’s ample stadium style seating all around for busy days. For what it’s worth, the lounge spots are comfortable too… the designers had the good sense to use wood rather than concrete, which is a nice little touch. Looking back into the city, you can see a long line of trees, and some grass that’s just asking to be picnicked on during the warmer months of the year. Just be sure to pack some snacks and water, as I didn’t really see much food in the immediate vicinity. Slightly redundant? Yes, but work with me here. When I said that I crammed a lot into my 4 days in Philly, I wasn’t kidding. I did a lot… like… a lot, and I’m going to share every moment of it with you. In upcoming articles I’ll cover some of my favorite bars and restaurants in various neighborhoods across the city, as well as some hidden gems I found just from wandering. I would also like to thank the kind folks at the Philadelphia Tourism Board (Visit Philly) for making this happen. I hope my writing and photos do this fine city justice!